Early on in my blogging adventure, I was lamenting to my friend Rob how having a blog makes you realize there are no truly original ideas anymore. He asked what I meant and I told him that no matter how creative you think your new, outside-the-box recipe idea may be... chances are someone has already thought about it AND blogged about it. Never believing me, he did his best to come up with the most ridiculous idea he could. His idea? A banana, dipped in yogurt and cereal and frozen like a popsicle. I laughed my "I know I'm right and you're wrong" laugh and proceeded to google his "new" idea. Sure enough. Several PAGES of search results popped up. It's not to say it was a bad idea, just not a totally original one, so I decided I would at some point make his banana pops on the blog. While most of the search results included either cereal or granola... I decided to make mine a little healthier and higher protein with custom-made trail mix at Whole Foods. (Plus, this put my own original twist on the recipe). Mine had a bunch of different types of nuts, dried fruits and even some carob chips. You'll also need some popsicle sticks to go along with your bananas and yogurt. Again, to up the healthy factor, I chose Greek yogurt. Now, I realize there are about a million and one Michael Scott/The Office jokes you could associate with this entire post. So I'm just going to acknowledge that and try to move on. Cut bananas in half and insert popsicle sticks. Dip banana in yogurt and roll in your topping of choice. Place bananas on a foil-lined baking sheet and freeze for an hour or until firm. And that's it! Frozen bananas sort of take on an ice cream consistency, so these are perfect for a healthy snack or dessert. These would be great for kids too... they could even help make them. And even though they may not be totally original, they are totally delicious. Thanks Rob! Insert Popsicle sticks into halved bananas. 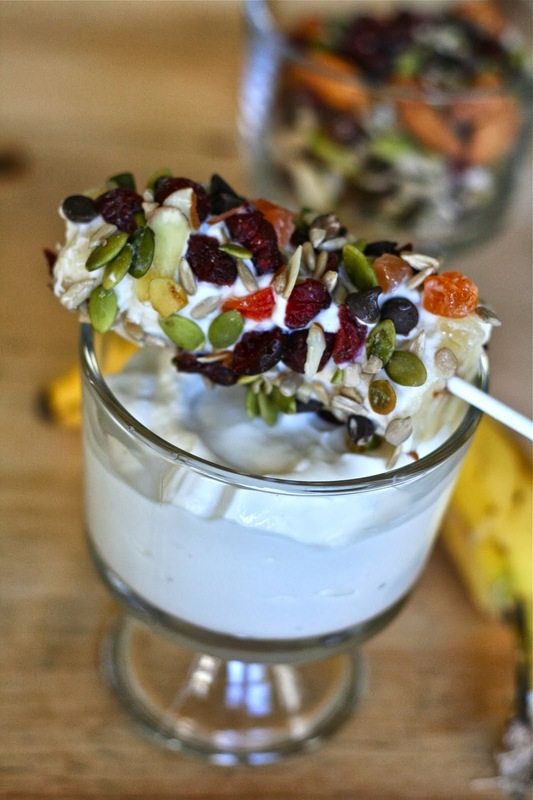 Place yogurt and trail mix (or cereal or granola) in separate shallow dishes. 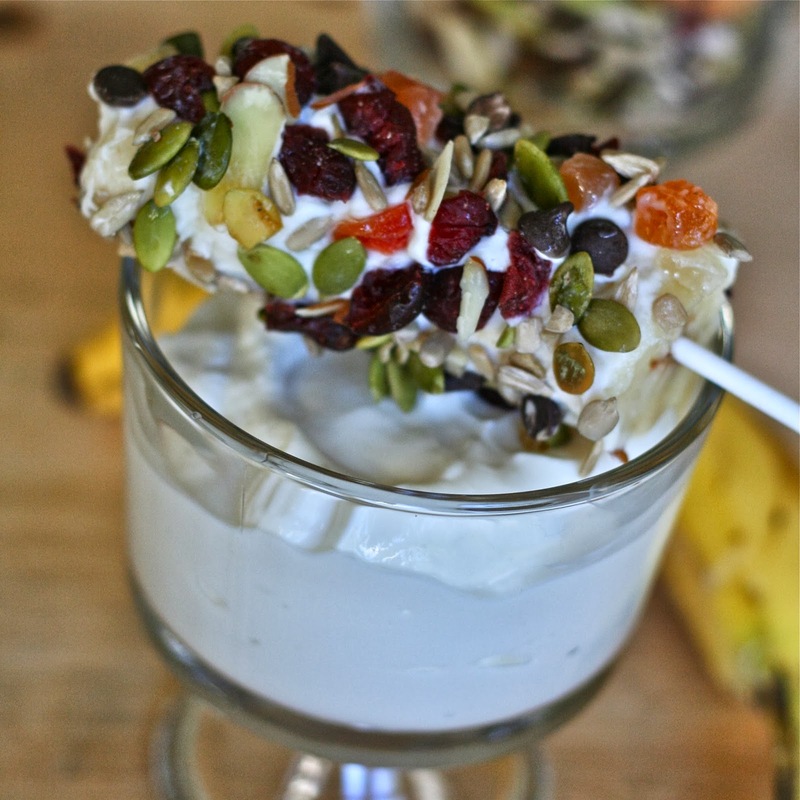 Cover bananas with vanilla yogurt and then dip in your topping of choice. Place on a foil or waxed paper-lined pan and freeze for 1 hour, or until firm. If not eating right away, wrap each "pop" in aluminum foil. Yum!! I need to try these and have the kids help!